Implement pay-for-performance financing models that reward successful efforts to reduce deforestation. Encourage state-level innovation within existing regulatory systems. Advance targeted policies that support existing private sector–led initiatives. Climate change is a threat not only to prosperity in the United States but also to national security, foreign policy, and development objectives throughout the world. Hurricane Sandy served as a reminder of the destruction to life and property from extreme weather events, which are likely to become more frequent and severe. Likewise, extended drought in the Southwest illustrates how climate change could affect agriculture, energy, recreation, and other major sectors of the US economy. The implications of climate change for the development prospects of poor countries are even worse. Lacking infrastructure, financial assets, insurance mechanisms, or strong institutions to cushion the impacts, developing societies remain highly vulnerable to natural disasters, including those resulting from increasingly irregular climatic conditions. The poorest households are most vulnerable — their houses often perch on steep, landslide-prone hillsides around cities or in coastal floodplains, and smallholder farmers lack irrigation and depend on increasingly erratic seasonal rains. US politics remain sharply divided over the appropriate responses to address climate change and climatic volatility, whether at home or abroad. Yet within the broader set of policy options, at least one area presents the opportunity for timely, strong bipartisan support—protecting tropical forests. Helping developing countries protect their tropical forests addresses both climate change and development objectives in ways that create benefits for the United States and poor countries alike. Tropical forests make many, often invisible, contributions to developing economies. The World Bank estimates that some 350 million people live in and around tropical forests. On average, such households derive more than one-fifth of their income from the harvest of products such as fuelwood, bushmeat, and medicinal plants. In addition, ecosystem services, such as the provision of clean and reliable water supplies, make important contributions to health, energy, and food-security outcomes. Forests also provide resilience to climate change impacts: undisturbed forests are more resistant to fire, forested hillsides help mitigate landslides and flooding, and mangrove forests attenuate waves from coastal storms. Reforms necessary to protect tropical forests are aligned with those needed to fight corruption, respect human rights, and promote the rule of law. Conserving tropical forests is a big part of the solution to climate change, in which everyone has an interest. Healthy, growing forests act as a safe and natural carbon capture and storage system. When forests are destroyed, the carbon accumulated in trees and soils is released into the atmosphere. The latest research indicates that halting tropical deforestation and allowing degraded forests to recover could mitigate 24–30 percent of current global greenhouse gas emissions. Forest-rich countries and the private sector are on board. Roughly 50 developing countries, including Brazil, Indonesia, and the Democratic Republic of the Congo, have stepped forward to cooperate in efforts to reduce deforestation under internationally negotiated rules to ensure that such efforts are environmentally effective and socially sound. In addition, an increasing number of international companies, including Walmart, Cargill, and Kellogg, have committed to eliminating deforestation (which often stems from production of soybeans, beef, or palm oil) from their supply chains within the next five years. Historically, the United States has provided political and financial leadership to global efforts to halt tropical deforestation. The United States has been a leading funder of initiatives to conserve biological diversity, such as improving management of conservation areas in the Congo Basin, fighting wildlife poaching in Nepal, and establishing a payment for environmental services program in Ecuador. In addition, it has executed 19 debt-for-nature swaps in 14 countries and has linked forest conservation to its bilateral trade agreement with Peru. With strong bipartisan support, tropical forests were a significant part of the 2009 cap-and-trade legislation that passed in the House but failed in the Senate. Most recently, the United States convened the Tropical Forest Alliance (TFA) 2020, a partnership to support implementation of zero-deforestation corporate commitments for commodities such as beef, soybeans, palm oil, and pulp and paper. The next US president should significantly expand efforts to halt deforestation by working closely with the US Congress, tropical countries, and private corporations. In doing so, he or she should actively pursue performance-based financing models to reward successful efforts, in combination with diplomacy and targeted policies that support private-sector initiatives. Why Forests and Why Now? Tropical forests contribute directly to development outcomes and maintaining them is a near-term solution to climate change. Everything but scaled-up finance is in place to make it happen. Because of the variety of forest goods and services that support livelihoods and economic opportunities, conserving tropical forests is sound development policy above and beyond its role as a low-cost approach to reducing carbon emissions. Forest fruits, nuts, and bushmeat contribute to food security; fuelwood supports energy security, and medicinal plants promote better health. On average, these and other forest products account for 21 percent of the incomes for tens of millions of families that live in and around forests. Less visible, but perhaps more important than forest products, are the contributions of forest-based ecosystem services to developing economies. Food Security: Forests provide the ecological infrastructure that supports agricultural productivity, regulating water quality and availability by filtering, reducing runoff, and facilitating water recycling. Rigorous new studies suggest that forests play a much greater role in driving the water cycle at broader scales than previously thought, carrying moisture from oceans into continental interiors and essentially driving the rainfall patterns that support inland agriculture in tropical geographies. Energy Security: Forested watersheds supply water to reservoirs behind hydroelectric dams and to irrigation systems. They also protect against the erosion and sedimentation that shorten the useful life of such infrastructure. A recent study calculated that cloud forests, though covering only a relatively small area of relevant watersheds (roughly 4 percent), supply more than 20 percent of the surface water to the reservoirs above dams in the tropics. Health: Recent research in Indonesia suggests that deforestation significantly increases the risk of malaria outbreaks. Maintaining intact forests also provides an important benefit to respiratory health by reducing smoke pollution caused by intentional burning to clear land and vulnerability to wildfires. Human Safety: Intact forests increase resilience to other extreme events besides forest fires. Complex root systems increase water infiltration and prevent erosion, helping to reduce both landslides and flooding following periods of heavy rain. One reason that Hurricane Mitch caused so much destruction when it hit Central America in 1998 was that there were few trees to slow the heavy rainfall dumped on deforested hillsides. For coastal communities, mangrove forests intercept wave energy, providing much-needed protection against storms and tsunamis. Furthermore, efforts to protect tropical forests can also promote good governance and the rule of law. Recent estimates suggest that nearly half of recent deforestation is the result of illegal clearing for commercial agriculture. Initiatives to clarify and strengthen property rights and address corruption can simultaneously reduce deforestation while providing broader development benefits. Tropical deforestation is a major source of the greenhouse gas emissions that cause climate change, with net emissions from forest loss constituting around one-tenth of current global emissions. If deforestation were a country, it would be among the world’s largest source of emissions, ranking between the European Union and China. As a result, no global climate protection strategy is complete without a focus on maintaining the world’s remaining tropical forests. Nonetheless, net emissions from forests as a share of total emissions understate the actual mitigation potential of tropical forests. If we stopped gross emissions by reversing deforestation and supported the carbon capture and storage function provided by forest regrowth, forests could mitigate up to 30 percent of current overall emissions. 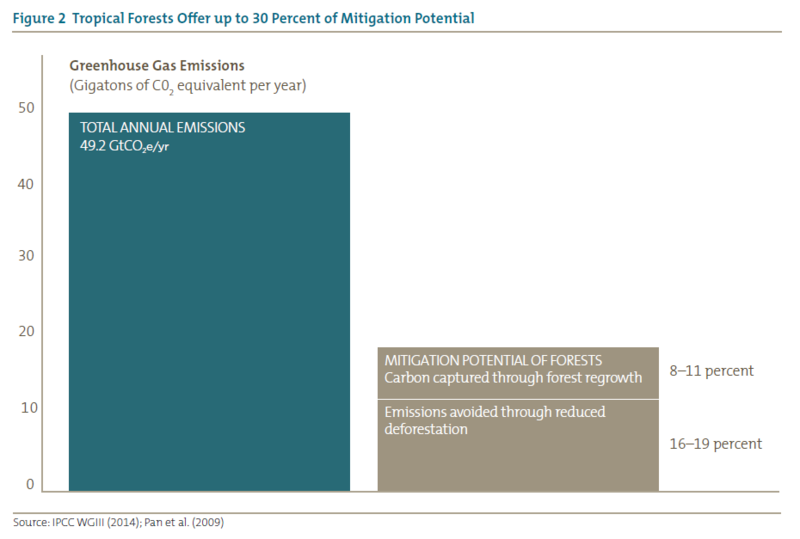 Reducing emissions from tropical forests is cheaper than nearly every alternative mitigation strategy. New analysis suggests that payments for reducing deforestation would constitute more than one-quarter of the low-cost opportunities to decrease carbon emissions in the developing world outside of China. Providing assistance to developing countries to reduce emissions from deforestation enables a higher level of ambition overall. Such reductions are available now and are 15–30 times cheaper than the cost of relying on carbon capture and storage technology to reduce fossil fuel emissions. Yet forests continue to be lost at an alarmingly high or even increasing rate in most tropical countries. Every year, more than 35,000 square miles of tropical forests are cleared — an area the size of Maine — while less than one-quarter of that area is allowed to grow back. 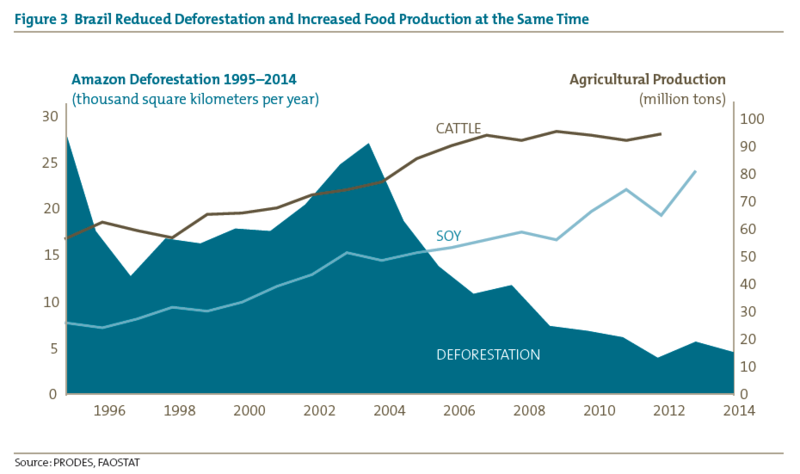 Commercial agriculture is the most important driver of deforestation. In fact, clearing land to produce just four globally traded commodities — beef, soy, palm oil, and pulp and paper — in only eight countries accounted for fully one-third of tropical deforestation in 2009 and no doubt even more today. Finding a way to redirect expanded agricultural production to low-carbon landscapes would make a globally significant dent in emissions. The good news is that slowing tropical deforestation is possible. All of the essential elements of a successful strategy — except scaled-up finance — are in place. Brazil’s dramatic reduction in Amazonian deforestation over the past decade provides proof-of-concept and shows what policies work. Extraordinary advances in remote-sensing technologies now make it possible to monitor deforestation over large areas cheaply and in real time. In addition, international consensus has been reached on a mechanism for rich countries to provide performance-based finance for reduced deforestation. Forest-rich countries have signaled their willingness to increase their level of ambition with additional finance, and significant private-sector actors have committed to transition to deforestation-free production practices. These factors have set the table for an initiative to tackle tropical deforestation that is worthy of a presidential legacy. Proof of Concept: Much is known about what drives deforestation and which policy tools can be deployed to reduce it. Forest protection is associated with the establishment of protected areas, targeted law enforcement efforts, and the presence of indigenous peoples. Economic “carrots,” such as payments for reducing deforestation, and “sticks,” such as withholding access to credit and markets from high-deforestation jurisdictions and companies, can also provide incentives for change. Brazil has demonstrated the effectiveness of these approaches, reducing deforestation by approximately 80 percent over the past decade, even while significantly increasing agricultural production. Technology: Advances in remote-sensing technology have been a key factor supporting Brazil’s success story. High-frequency satellite-based monitoring of deforestation “hot spots”—often suggesting illegal clearing and burning — empowers governments and activists to pinpoint deforestation and respond with law enforcement efforts and market campaigns. Thanks to a revolution in satellite imagery resolution, it is now possible to measure forest cover change and carbon density with a high degree of accuracy, providing an objective basis for financial rewards to countries that have reduced deforestation. International Consensus: Over the last decade, Reducing Emissions from Deforestation and Forest Degradation (REDD+) has been one of the most productive areas of negotiation under the United Nations Framework Convention on Climate Change (UNFCCC). 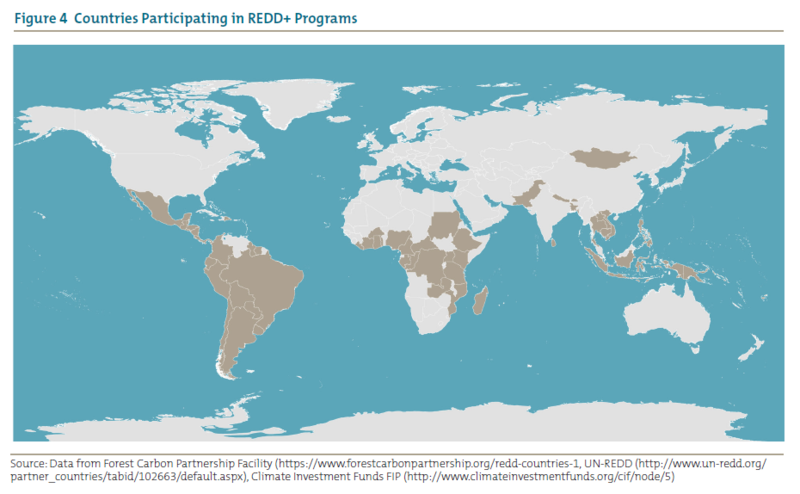 As a mechanism under which rich countries provide performance-based finance to tropical forest countries for reducing forest-based emissions, REDD+ has enjoyed an unusual degree of consensus across both developed and developing countries. The mechanism includes rules to ensure that emission reductions are real and that the interests of indigenous and other communities are protected. But finance is needed to give meaning to the agreement. New Private-Sector Constituencies: As mentioned earlier, clearing forests to produce globally traded commodities such as beef, soy, palm oil, and pulp and paper is a significant driver of deforestation. Over the past two years, a growing number of companies that produce, trade, or purchase “forest-risk” commodities have committed to deforestation-free supply chains. In September 2014, 34 companies, including US corporate giants such as Cargill, McDonalds, and Walmart, joined the United States and 26 other governments in signing on to the New York Declaration on Forests, committing themselves to halving deforestation by 2020 and ending natural forest loss by 2030. The United States has long been a global leader in protecting tropical forests and has supported the role that forests can play in mitigating climate change both domestically and abroad. The United States was among the top five bilateral donors for international forestry prior to the linkage of deforestation to climate change, and it has maintained that position in pledging funds for REDD+. Nevertheless, a significant gap remains between the level of funds currently available and what is needed to incentivize more ambitious efforts by forest-rich countries to address the drivers of deforestation. Compliance markets for emission reductions, under discussion in the late 2000s, would have generated large demand for forest carbon “offsets” and significant funding for tropical forest protection. In fact, the ultimately unsuccessful American Clean Energy and Security Act of 2009 (known as the Waxman-Markey bill) alone would have created demand for about one-fifth of annual global emissions from land use and land use change and, through a separate mechanism, would have provided an additional $3 billion annually for forest protection. Because compliance markets have been slow to materialize, government leaders and private-sector entrepreneurs who invested political and financial capital in REDD+ initiatives have been faced with limited demand for the results of their efforts. Because the volume of forest carbon offsets available on the voluntary market exceeds demand, their average price has been decreasing. Scaled-up finance from compliance markets or multilateral funding efforts are unlikely to generate sufficient finance prior to 2020 at the earliest, when pledges made by governments in 2015, ahead of the climate negotiations in December in Paris, are scheduled to come into effect. As a result, significant funding is needed now to create demand for reduced deforestation to bridge the gap until substantial market-based sources of finance are in place, in addition to ensuring that post-2020 pledges are sufficiently ambitious. The next US president should complement the US commitment to domestic climate mitigation expected to be included in the Paris agreement with an additional pledge to reward forest-rich countries for reducing their emissions (including, but not limited to, those from deforestation), taking effect before the 2020 goals come into force and ramping up afterward. This “international mitigation pledge”—quantified as a percentage of US emissions in addition to domestic emissions cuts — would have a powerful leveraging effect on the actions of other countries. Such a pledge would likely prompt similar commitments from other industrialized nations and increase ambition in tropical countries to accelerate implementation of REDD+ initiatives. To take advantage of this opportunity to address existing impediments to more ambitious global efforts to fight deforestation, the next US president should pursue a three-pronged approach. Such an approach would (1) increase performance-based assistance immediately, (2) implement regulatory changes to generate more finance in the medium term, and (3) take diplomatic and trade-related actions that support private sector–led initiatives focused on deforestation-free supply chains. 1 Increase performance-based assistance for tropical forests. In the near term, countries that have already initiated programs to reduce deforestation and have offered to do more with international support require increased and more targeted bilateral and multilateral assistance. Currently, related US investments total roughly $250 million annually; however, these investments are spread over several agencies and a large number of countries, vehicles, and approaches. The disparate efforts — led by USAID, the Millennium Challenge Corporation (MCC), the State Department, and Treasury Department — should be better coordinated and concentrated on a limited number of countries that drive global deforestation and are strategic US partners. In addition, these programs should pilot payment-for-performance approaches, thereby generating bigger bang for scarce US taxpayer resources. Payment-for-performance financing is a “no regrets” approach with bipartisan appeal. If emissions from deforestation are not reduced, then the US government would not disburse any funds. Put differently, US taxpayer resources would only be provided for independently verified results compared to benchmarks agreed-upon beforehand. Such approaches will also generate lessons learned on what works when “cash-on-delivery” aid principles are applied to reducing forest carbon emissions. Acting on these lessons to improve performance will then strengthen the case for finance through compliance markets in the future. The United States already provides a modest level of performance-based finance through its contribution to the World Bank’s Forest Carbon Partnership Facility Carbon Fund. At the same time, increasing the envelope of forest-related funding would have even greater impact. If the next US president were to announce a bold pledge of at least $1 billion per year until 2020, it would send a strong signal to forest-rich countries to continue and improve their efforts and would leverage increased contributions from other donors. The $1 billion figure is within reach through a combination of targeted USAID funding, Millennium Challenge Corporation (MCC) compacts, Overseas Private Investment Corporation (OPIC) investments, and earmarked contributions through the Green Climate Fund. And yet it is sufficiently large to signal serious intent to tropical forest countries. REDD+ experience to date has shown that international partnerships of this magnitude can fortify or catalyze action even in middle-income countries such as Brazil and Indonesia. 2 Use regulatory approaches to encourage state-level innovation. In the absence of a carbon tax or cap-and-trade system at the federal level, the Environmental Protection Agency’s (EPA’s) existing Clean Air Act regulatory authority offers the best way to mobilize additional funding for reducing emissions from tropical deforestation. The next presidential administration should encourage states to mirror the proposed international mitigation pledge by going beyond compliance with the rules currently being finalized for power plant emissions to also create demand for forest offsets. For instance, California is considering how to include such offsets in its cap-and-trade program and is making progress in developing a set of rules to ensure that such offsets are “real, additional, quantifiable, permanent, verifiable, and enforceable.” The EPA should encourage other states to adopt cap-and-trade models, facilitate participation in regional compliance mechanisms (that is, allow collective compliance across states through markets for emission reductions), and serve as a broker for states willing to top up mandated cuts with international forest carbon offsets. The potential for marshaling such demand for forest carbon offsets in the fight against tropical deforestation was the impetus behind the formation of the Governors’ Climate and Forests Task Force mentioned earlier. Indeed, the prospect of such demand provided important early stimulus to efforts to reduce emissions from deforestation in Brazil, Indonesia, Mexico, Nigeria, and Peru, and states and provinces participating in the task force have offered to cut emissions 80 percent by 2020 if matched with performance-based finance. But as revenue to reward reduced emissions from deforestation has not yet materialized, initiatives taken by political leaders in those countries are at risk. 3 Support private-sector supply-chain initiatives. Through their supply-chain commitments related to the sourcing of paper, palm oil, and other commodities, private companies ranging from Disney to Dunkin’ Donuts have stepped forward to be part of the solution to deforestation. But their initiatives will not succeed without government action in both producer and consumer countries. As long as producer companies are freely allowed to continue to deforest and can find international markets for their products, progressive companies will be disadvantaged even while their commitments to reduce deforestation are undercut. By providing complementary support to enhance the feasibility of implementing deforestation-free supply-chain commitments, increased REDD+ finance, combined with US diplomatic and trade efforts to transform commodity markets overall, would likely fuel more interest and commitments from additional companies in the United States and elsewhere. In a virtuous circle, new private-sector constituencies and market signals that reward reduced deforestation would in turn motivate governments in producer countries, such as Indonesia, to enact necessary legal and regulatory reforms and provide incentives for improved performance to private companies. With the TFA, the United States has already established a public-private partnership dedicated to reducing tropical deforestation associated with global commodities such as beef, soy, palm oil, and pulp and paper. The TFA would get a big lift from presidential-level endorsement of clear goals and deadlines and the convening of a White House task force to coordinate activities across agencies. With leadership from the State Department, the next administration should also expend more diplomatic capital in convening governments and corporations from both producer and consumer countries to make and implement commitments to deforestation-free supply chains. A “Palm Oil Pledge”—brokered by the US Embassy in Jakarta in September 2014 — brought together key companies associated with the palm oil industry in Indonesia, demonstrating the potential catalytic role of US initiative. In addition, the United States should take specific measures to ensure that access to the $17 trillion US economy rewards exporters of “forest-risk” commodities that are legally produced and punishes those responsible for illegal deforestation. Illegal timber harvest deprives producer countries of tax revenue and depresses prices of domestically produced timber in consumer countries, including the United States, with annual losses estimated to be up to $1 billion. The next US president should request increased funding to implement the 2008 amendments to the Lacey Act, which were designed to prevent the import of illegal timber into the United States. In 2012, funding appropriated to federal agencies to enforce the law and conduct outreach to affected companies was a mere $13.5 million; increased funding could enable greater impact. For example, enforcement actions should be extended to cover timber produced when forests are illegally cleared for agricultural commodity production. The next US president should also work with businesses, nongovernmental organizations, and forest countries alike to advance similar legal frameworks that apply to the other products that drive global deforestation, thus creating and supporting a global norm that trade in the products of illegal deforestation is unacceptable to both importer and exporter nations. Protecting tropical forests is a sound investment in US and global prosperity, national security, and US commercial interests. Reducing deforestation is a significant, low-cost portion of the overall solution to climate change and supports the achievement of development goals. Effective policy tools exist today, and success has been demonstrated. International consensus has been reached, with forest-rich countries ready to act. Major US and global corporations are on board. The missing ingredient for breakthrough progress is US presidential leadership that would mobilize performance-based financing models, complemented by diplomacy and demand-side policies. Frances Seymour and Jonah Busch. “Forests Contribute to Development.” In Why Forests? Why Now? The Science, Economics, and Politics of Tropical Forests and Climate Change. Washington: Center for Global Development, forthcoming. Michael Wolosin and Donna Lee. “US Support for REDD+: Reflections on the Past and Future Outlook.” CGD Policy Paper 48, Center for Global Development, Washington, 2014. Jesse Lueders, Cara Horowitz, Ann Carlson, Sean B. Hecht, and Edward A. Parson. “The California REDD+ Experience: The Ongoing Political History of California’s Initiative to Include Jurisdictional REDD+ Offsets within Its Cap-and-Trade System.” CGD Working Paper 386, Center for Global Development, Washington, 2014. Rosa C. Goodman and Martin Herold. “Why Maintaining Tropical Forests Is Essential and Urgent for a Stable Climate.” CGD Working Paper 385, Center for Global Development, Washington, 2014. Katrina Brandon. “Ecosystem Services from Tropical Forests: Review of Current Science.” CGD Working Paper 380, Center for Global Development, Washington, 2014. Katrina Mullan. “The Value of Forest Ecosystem Services to Developing Economies.” CGD Working Paper, Center for Global Development, Washington, 2014. Andreas Dahl-Jorgensen. The Billion-Ton Solution: Europe’s Chance to Lead on Climate Action through International Mitigation Partnerships. Washington: Climate Advisers, 2014. See “Climate Impacts in the Southwest,” US Environmental Protection Agency, www.epa.gov/climatechange/impacts-adaptation/southwest.html. Program on Forests (PROFOR), “Forests and Poverty Reduction” (World Bank brief, August 28, 2013), www.worldbank.org/en/topic/forests/brief/forests-poverty-reduction. Arild Angelsen, Pamela Jagger, Ronnie Babigumira, Brian Belcher, Nicholas J. Hogarth, Simone Bauch, Jan Börner, Carsten Smith-Hall, and Sven Wunder, “Environmental Income and Rural Livelihoods: A Global-Comparative Analysis,” World Development (April 2014), doi:10.1016/j.worlddev.2014.03.006. Katrina Mullan, “The Value of Forest Ecosystem Services to Developing Economies” (CGD Working Paper 379, Center for Global Development, Washington, 2014), www.cgdev.org/publication/value-forest-ecosystem-services-developing-economies-working-paper-379. Frances Seymour and Arild Angelsen, “Summary and Conclusions: REDD Wine in New Wineskins?” in Realizing REDD+: National Strategy and Policy Options, ed. Arild Angelsen (Bogor, Indonesia: CIFOR, 2009). Rosa C. Goodman and Martin Herold, “Why Maintaining Tropical Forests Is Essential and Urgent for a Stable Climate” (CGD Working Paper 385, Center for Global Development, Washington, 2014), www.cgdev.org/publication/why-maintaining-tropical-forests-essential-and-urgent-stable-climate-working-paper-385; Frances Seymour and Jonah Busch, “Forests Contribute to Development,” in Why Forests? Why Now? The Science, Economics, and Politics of Tropical Forests and Climate Change (Washington: Center for Global Development, forthcoming), www.cgdev.org/why-forests-why-now. USAID, Biodiversity Conservation and Forestry Programs, 2013 Report (Washington: US Agency for International Development, 2013). Annex on Forest Sector Governance, February 1, 2009, United States – Peru Trade Promotion Agreement: Chapter Eighteen, Environment, Annex 18.3.4, Office of the United States Trade Representative, https://ustr.gov/sites/default/files/uploads/­agreements/fta/peru/asset_upload_file953_9541.pdf. Michael Wolosin and Donna Lee, “US Support for REDD+: Reflections on the Past and Future Outlook” (CGD Policy Paper 48, Center for Global Development, Washington, 2014), www.cgdev.org/publication/us-support-redd-reflections-past-and-future-outlook. Katrina Brandon, “Ecosystem Services from Tropical Forests: Review of Current Science” (CGD Working Paper 380, Center for Global Development, Washington, 2014), www.cgdev.org/publication/ecosystem-services-tropical-forests-review-current-science-working-paper-380. Deborah Lawrence and Karen Vandecar, “Effects of tropical deforestation on climate and agriculture,” Nature Climate Change (5) 27–36, 2015. Mark Mulligan and Leonardo Saenz, “The Role of Cloud Affected Forests (CAFs) on Water Inputs to Dams,” Ecosystem Services 5: 69–77. Teevrat Garg, “Public Health Effects of Natural Resource Degradation: Evidence from Indonesia” (paper presented at the Agricultural and Applied Economics Association Annual Meeting, Minneapolis, MN, July 27–29, 2014), http://purl.umn.edu/169822. 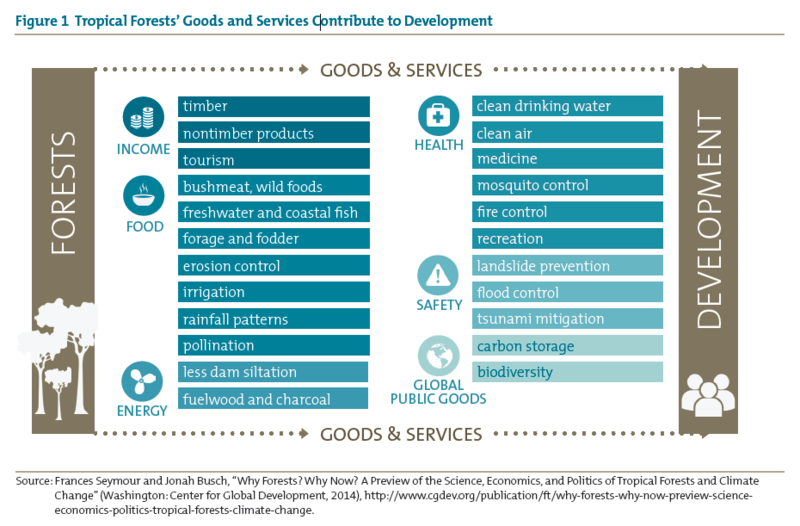 Katrina Brandon, “Ecosystem Services from Tropical Forests: Review of Current Science” (CGD Working Paper 380, Center for Global Development, Washington, 2014), http://www.cgdev.org/publication/ecosystem-services-tropical-forests-review-current-science-working-paper-380. Evamaria W. Koch, Edward B. Barbier, Brian R. Silliman, Denise J. Reed, Gerardo Me Perillo, Sally D. Hacker, Elise F. Granek, et al., “Non-Linearity in Ecosystem Services: Temporal and Spatial Variability in Coastal Protection,” Frontiers in Ecology and the Environment 7(1): 29–37, doi:10.1890/080126; Edward B. Barbier, Sally D. Hacker, Chris Kennedy, Evamaria W. Koch, Adrian C. Stier, and Brian R. Silliman, “The Value of Estuarine and Coastal Ecosystem Services,” Ecological Monographs 81(2): 169–193, doi:10.1890/10-1510.1. Sam Lawson, Consumer Goods and Deforestation: An Analysis of the Extent and Nature of Illegality in Forest Conversion for Agriculture and Timber Plantations (Washington: Forest Trends, 2014), http://www.forest-trends.org/documents/files/doc_4718.pdf. Jonah Busch and Jens Engelmann, “Future of Forests” (CGD Working Paper, Center for Global Development Washington, forthcoming). M. C. Hansen, et al., “High-Resolution Global Maps of 21st-Century Forest Cover Change,” Science 342: 850–853. Martin Persson, Sabine Henders, and Thomas Kastner, “Trading Forests: Quantifying the Contribution of Global Commodity Markets to Emissions from Tropical Deforestation” (CGD Working Paper 384, Center for Global Development, Washington, 2014), www.cgdev.org/publication/trading-forests-quantifying-contribution-global-commodity-markets-emissions-tropical. Kalifi Ferretti-Gallon and Jonah Busch, “What Drives Deforestation and What Stops It? A Meta-Analysis of Spatially Explicit Econometric Studies” (CGD Working Paper 361, Center for Global Development, Washington, 2014), www.cgdev.org/publication/what-drives-deforestation-and-what-stops-it-meta-analysis-spatially-explicit-econometric. Scott J. Goetz, Matthew Hansen, Richard A. Houghton, Wayne Walker, Nadine Laporte, and Jonah Busch, “Measurement and Monitoring for REDD+: The Needs, Current Technological Capabilities and Future Potential” (CGD Working Paper 392, Center for Global Development, Washington, 2014), www.cgdev.org/publication/measurement-and-monitoring-redd-needs-current-technological-capabilities-and-future. Antonio G.M. La Viña and Alaya de Leon, “Two Global Challenges, One Solution: International Cooperation to Combat Climate Change and Tropical Deforestation” (CGD Working Paper 388, Center for Global Development, Washington, 2014), www.cgdev.org/publication/two-global-challenges-one-solution-international-cooperation-combat-climate-change-and. Governors’ Climate and Forests Task Force (GCF), “Rio Branco Declaration,” August 11, 2014, www.gcftaskforce.org/documents/­2014_annual_meeting/GCF_RioBranco­Declaration_August_5_2014_EN.pdf. UN-REDD, “UN Climate Summit: New York Declaration on Forests,” September 2014, www.un-redd.org/portals/15/documents/­ForestsDeclarationText.pdf. Consumer Goods Forum, “The Consumer Goods Forum Calls for Binding Global Climate Change Deal,” June 28, 2014, www.theconsumergoodsforum.com/the-consumer-goods-forum-calls-for-binding-global-climate-change-deal. Marigold Norman and Smita Nakhooda, “The State of REDD+ Finance” (CGD Working Paper 378, Center for Global Development, Washington, 2014), www.cgdev.org/publication/state-redd-finance-working-paper-378. Compliance markets allow polluters to meet emission reduction requirements by purchasing emission reductions produced by others at lower cost. Forest Trends, “Executive Summary,” Turning Over a New Leaf: State of the Forest Carbon Markets 2014 (Washington: Forest Trends’ Ecosystem Marketplace, 2014), www.forest-trends.org/documents/files/doc_4771.pdf. For a detailed articulation of this proposal, see Andreas Dahl-Jorgensen, The Billion-Ton Solution: Europe’s Chance to Lead on Climate Action through International Mitigation Partnerships (Washington: Climate Advisers, 2015), www.climateadvisers.com/wp-content/uploads/2015/02/The-Billion-Ton-Solution-Dahl-Jorgensen-15-0220-Final.pdf. This recommendation should be considered in concert with the White House and the World brief, “Shifting the Foreign Aid Paradigm: Paying for Outcomes” by William Savedoff, Rita Perakis, and Beth Schwanke (Washington: Center for Global Development, 2015). Nancy Birdsall, William D. Savedoff, Ayah Mahgoub, and Katherine Vyborny, Cash on Delivery: A New Approach to Foreign Aid (Washington: Center for Global Development, 2010). Sergio Abranches, “The Political Economy of Deforestation in Brazil and Payment-for-Performance Finance” (CGD Background Paper, Center for Global Development, Washington, 2014), www.cgdev.org/sites/default/files/CGD-Climate-Forest-Paper-Series-10-Abranches-Deforestation-Brazil_0.pdf; Metta Dharmasaputra and Ade Wahyudi, “The Impact of Payment-for-Performance Finance on the Political Economy of Deforestation in Indonesia” (CGD Climate Forest Series 9, Center for Global Development, Washington, 2014), www.cgdev.org/sites/default/files/CGD-Climate-Forest-Series-9-Dhamasaputra-Wahyudi-Indonesia.pdf. Jesse Lueders, Cara Horowitz, Ann Carlson, Sean B. Hecht, and Edward A. Parson, “The California REDD+ Experience: The Ongoing Political History of California’s Initiative to Include Jurisdictional REDD+ Offsets within Its Cap-and-Trade System” (CGD Working Paper 386, Center for Global Development, Washington, 2014), www.cgdev.org/publication/california-redd-experience-ongoing-political-history-californias-initiative-include. GCF, “Rio Branco Declaration,” August 5, 2014, www.gcftaskforce.org/documents/­2014_annual_meeting/GCF_RioBrancoDeclaration­_August_5_2014_EN.pdf. Tropical Forest Alliance 2020 website, www.tfa2020.com/. Michael Wolosin, “Breaking the Link between Commodities and Climate Change” (Washington: Climate Advisers, 2013), www.climateadvisers.com/breaking-the-link-between-commodities-and-climate-change/. US Department of State, “Signing of Indonesia Palm Oil Pledge,” September 25, 2014, www.state.gov/r/pa/prs/ps/2014/09/232104.htm. American Forest and Paper Association, “Illegal” Logging and Global Wood Markets: The Competitive Impacts on the US Wood Products Industry, prepared by Seneca Creek Associates, LLC, and Wood Resources International, LLC (2004). P. Elias, Logging and the Law. How the US Lacey Act Helps Reduce Illegal Logging in the Tropics (Cambridge, MA: Union of Concerned Scientists, 2004), www.ucsusa.org/sites/default/files/­legacy/assets/documents/global_warming/­illegal-logging-and-lacey-act.pdf. Environmental Investigation Agency, “The US Lacey Act: Tackling the Illegal Trade in Timber, Plants and Wood Products, Funding for Implementation in 2012,” http://eia-global.org/lacey/.